Absolutely Unique Multishower System / Shower Room. 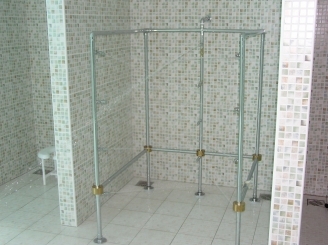 Includes 5 different types of therapeutic showers. This unique system is controlled by just one hydrotherapist / operator saving your spa / medical spa / resort huge amount of money and space. This highly advanced Multishower System can be installed in middle size shower rooms with minimum square footage of app. 300 sq.ft. Multishower System Combi-Exclusive is equipped with exclusive automatic water mixing and distributing system providing individual control of pressure and temperature for each water line / shower making it highly safe and reliable, easy to operate and low maintenance shower system. 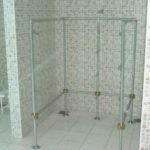 Special professional showers and other wet room treatments will expand your business and improve client retention. High-end Multishower system will dramatically upgrade the concept and expand functionality of your spa, bath-house, sauna, steam room or banya. RMS has the technology to give you visibility and control all along the way. Styling you've never seen. Handling you'd never expect. Features you'd never imagine. Multishower System Combi-Exclusive consists of 5 showers controlled simultaneously by one operator. 1. MSE/D - 05/04 SPECIAL WATER DISTRIBUTION SYSTEM. Equipped with control valves (6pcs), pressure / temperature gauge (1pc), clear acrylic protective screen with chrome plated molding. 2 flexible hoses for Charcot shower with adjustable spray nozzles. Ergonomic design. Material: high-gloss white acrylic, brass, copper, chrome plated. Elegant chrome plated horizontal affusion/ Vichy shower equipped with 7 shower heads/ water injectors. White acrylic box for easy installation. Material: brass chrome plated, high-gloss white acrylic. Exclusive 15" solid brass chrome plated waterfall. High-gloss white acrylic box. Circular Swiss Shower is a cascading vertical spray shower equipped with shower heads/ water injectors. It creates a gentle or vigorous rain shower from shoulders to anklets from above. Circular Swiss Shower model Standard class Economy is equipped with12 shower heads / water injectors. Extra thick thermoformed white high gloss acrylic seat mounted on a white powder painted frame.